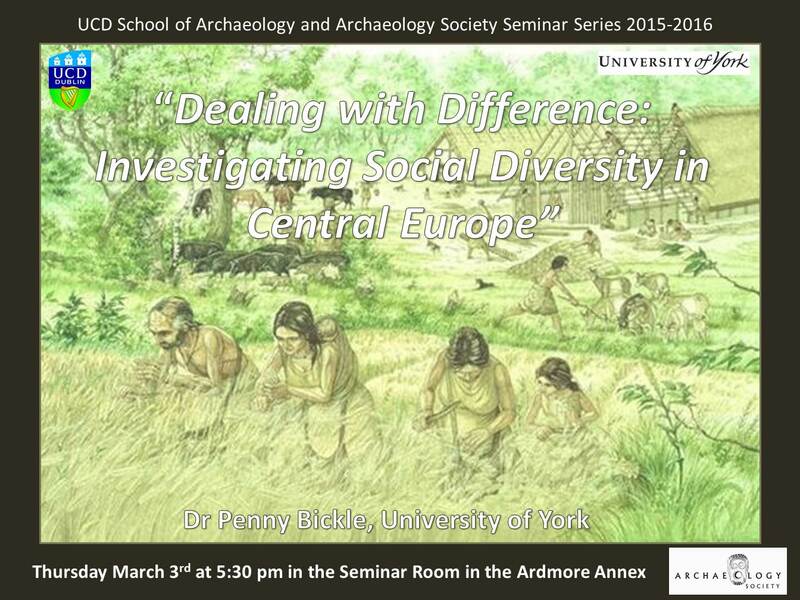 Last Thursday evening, the Archaeology Society was delighted to welcome Dr. Penny Bickle from the University of York, who gave a lecture entitled “Dealing with Difference: Investigating Social Diversity in the Central European Neolithic”. The lecture commenced with Dr. Bickle mentioning two of the projects that she has been involved in, and stating how there has been a relative tendency towards hesitation when it comes to discussing social differences during the Neolithic. She then moved her talk onto the discussion of the archaeology of the Central European Neolithic, with a focus on the Linear Band Keramic (LBK) culture. Most of the evidence for Central European Neolithic comes from the settlement of the LBK, which consisted of villages containing longhouses, with clusters of settlements alongside river valleys. Dr. Bickle proceeded to then discuss the pottery evidence for the LBK and what it says about regional diversity and hierarchy within the culture, with prestige objects dominating. She used the very effective analogy of football teams when explaining pottery diversity within different LBK groups - everyone was playing by the same rules, but for different teams, but there is also the possibility that they could have even been playing different ball games altogether. She then discussed the details of her first project, “The First Farmers in Central Europe: Diversity in LBK lifeways” (2013), which utilised the study of isotopes to determine diet, which revealed that hunter-gatherers and farmers had a widespread similarity in diet, and that the evidence exhibited the sharing of food between settlements, but the project was not able to determine any changes over time. The second project, “The Time of their Lives: Precise chronologies for the European Neolithic” (http://totl.eu/), currently ongoing and led by Dr Alasdair Whittle and Alex Bayliss, uses Baysian modelling techniques to address what the previous project could not, examining change over time across different cultural groups, but due to a limited stratigraphy resorted to the examination of the different ceramic phases of the LBK across Europe. The results of both projects concluded that there were changes in social relations of Neolithic Europe between 5160 – 5115 BC, with periods of increased and stable settlements and then a collapse, the reason for which is unclear, with the society focusing on the contemporary social groups as opposed to previous generations being the focal point. To conclude, Dr. Bickle’s work has shown that social relations and kinship played a central role in the LBK way of life, alongside a system of shared values, and those communities on the edges of the society exhibiting more variation. Overall it was a very engaging talk that was enjoyed by all who attended, and we look forward to hearing of Dr. Bickle’s fantastic work in the future.